We are posting Cyber Monday deals on our Mom’s Priority Deals page so don’t miss out today! Particularly, find gift items at deeply discounted prices. 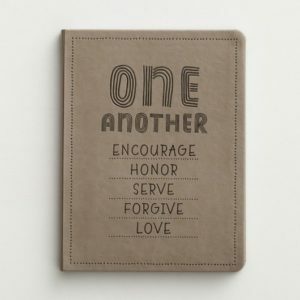 For example, Dayspring, Zazzle, and Swoozies are having great sales today! 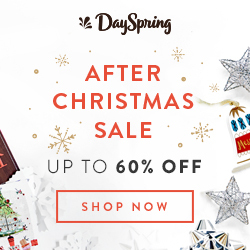 Dayspring is one of the best sites to go to for Christian gifts. If you are looking for religious teacher gifts at great prices, you can take 35% off sitewide in DaySpring’s Cyber Monday Sitewide Sale. Use code MONDAY17. All week, take 50% off customer favorites in DaySpring’s Cyber Week Markdown Specials. Simple, but thoughtful gifts, include inspirational mugs and journals. Both are offered at $5! Swoozies/ Beau-Coup is the best place to go for beautiful hostess gifts and custom stationery. They also carry great market totes, acrylic tumblers, and custom paper products like napkins and plates. This is a fun company with so many creative products. Shop Swoozies’ Cyber Monday Sale. 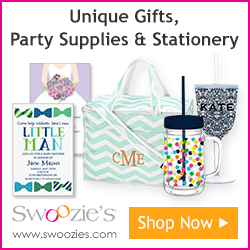 20% off sitewide + free shipping at Swoozies. Gone are the days when Black Friday was only the day after Thanksgiving. A few years ago, it began creeping into Thanksgiving Day. Now, the term “Black Friday” can refer to almost any day from November 1 and beyond! But especially this week, also called “Peak Week,” the specials are starting! You can expect to find steep discounts at Kohl’s, with an average of 66% off according to WalletHub. Plus, use promo code SAVEBIG15 to save an additional 15% off. Today, Kohls Black Friday Deals start, and here are some of the highlights from the Kohls Black Friday Ad. Check back early on Thanksgiving Day for the Doorbuster special links. See our list of Black Friday Deals for the best deals! This is a post that someone needs to read; it may be you! With online shopping surpassing in-store retail shopping this Christmas (source: Deloitte), more than likely, you are planning to shop online. Online Christmas shopping is wonderful and convenient (usually) and can save you time and money. And at Mom’s Priority, we want to help make it easier for you!! But, you need to know how to protect yourself and how to spot dishonest merchants and criminals. As a fellow mom, I feel I need to make you aware of warning signs and help keep you all safe online! Shop smart online this Christmas season with these tips. Who are your buying from? Ensure websites are legit by googling them if they are not a large, well-known company. See who they keep company with. Just like we tell our kids, who they relate with says much about them! While this isn’t 100% proof, this little bit of research may end up protecting your personal information. Recently, Google made the announcement that they are going to penalize websites that are not secure in Google search. One way you can tell the “real” sites from the others is that green padlock and the “s” on https:// preceding their website name. Always, always, only give your credit card info on sites that have that AND ALSO meet the other criteria listed here! That green padlock says the site is secure and uses encryption so your credit card information cannot be easily stolen as data is transferred over the web. For online shopping, using a credit card (vs a debit card) is a must. If someone were to get your debit card information, they could wipe out your savings and you have little recourse. Most credit cards have protections included in case your card is lost or stolen. Remember, the credit card number, expiration date, and security code are just as good as having the card in most cases. So, protect that information! Credit cards are much safer for shopping online. You can dispute unauthorized charges and let their fraud protection team investigate. Debit cards are not good for online shopping. Public wi-fi is not appropriate for buying online or checking your bank account. You can SHOP all day long on public wi-fi, but don’t put your personal information in to buy until you are using a secure internet connection. Never reply to emails requesting that you enter your credit card information on their site. Instead, go directly to the site when in doubt. This season already, reports indicate a scam where the sender claims to be Amazon. The email says your order cannot be processed because your credit card information is incorrect. They tell you to click on the link to take you to “Amazon’s site” and reenter your info so your order can be processed. Do not go to their site that even looks like authentic Amazon! Because, they are stealing your credit card info as you enter it for them. Instead, go directly to Amazon’s site and look at your orders to verify their claim. If it’s Sounds too Good to be True, it Probably Is! It’s not fun and takes the buzz away from shopping (haha! ), but it is important that before you click “purchase” you read the fine print! Know the policies of different retailers (which, you learn after shopping a couple of times!). For example, Amazon orders can be returned at Kohl’s now. Most online stores that also have brick and mortar stores allow you to return the items with no penalty at their physical store. However, some returns incur restocking fees or shipping fees at your expense. Know how long you have to make a return. It’s your job to know what you are getting into when you make the purchase. If you’re not familiar with these terms, basically, go to Internet Options, then Clear Browsing History frequently. What merchants do is store your info and preferences to keep page load time down and get to know you in a sense. Pages are tailored with you in mind. While that is generally not a problem, it is beneficial for you to clear it on occasion. New viruses and malware come out every day. The only way to protect yourself and your machines is to keep the software up to date. You need firewall, anti-virus, and anti-spyware software installed and running. When they update, you need to update if it’s not done automatically behind the scenes to make sure you are protected. Run virus scans regularly and make sure you install the latest updates. Keep an eye on packages arriving to your door. At Christmastime, there is an increased risk of theft anyways. This also includes delivered packages. You can either print a receipt or make sure you received the email that tells what was purchased and when delivery is expected. That way, if you have any discrepancies or need to return, you have documentation. Shopping online is convenient and quick, as long as you’re dealing with honest merchants and secure websites. You can save a ton of money by shopping online this Christmas, and Mom’s Priority has a variety of ways to help you do that. 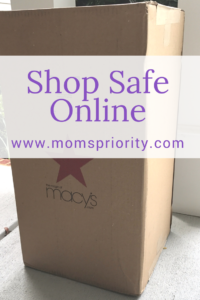 Please stay vigilant as you shop online to protect your identity this season, and if you have any questions, please email me at momspriority@gmail.com. Happy shopping!! 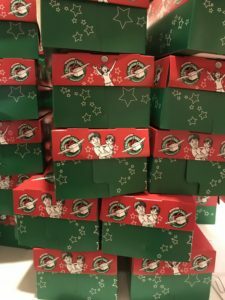 If you are still looking for gift ideas for elementary-aged kids, here are two top ten lists that you do not want to miss. Kids this age can be hard to buy for, so we’ve included favorite book series, toys, and games. Last minute deals abound, and shipping is still available, so check out these deals below! Check out Vera Bradley’s Winter Collection! 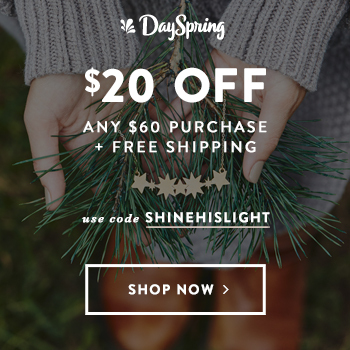 Use code SHINEHISLIGHT for $20 off any $60 purchase plus free shipping. Offer will expire December 31st. Gymboree: Clothes that last and kids love, on sale now! Hanna Andersson : Well-made clothes that last. 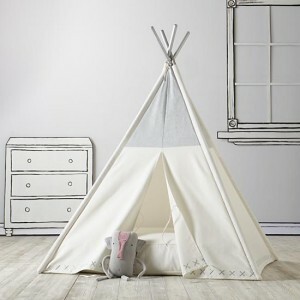 New customers save 10% off their total order at Hanna Andersson. Enter Code CELEBRATE10 at checkout. Some exclusions apply. Expires 12/25/16. Hanna Andersson’s family pajamas become part of holiday celebrations year after year. Shop new & returning collections and make this year’s memories more special than ever. Valid 9/26- until supplies last. Crazy 8: Fun clothes for fun kids! Low prices! Take 15% off sitewide with code WREATH. Valid 12/11-12/24. Kohl’s Charge holders save 30% off with code FROSTING30. Valid 12/11-12/24. Please note that the Christmas Shipping cutoff will be Monday, December 19th. Walmart: No shipping fee when you spend $50! Get a Sam’s Club Membership and Save – Join for $45 per year! Bring the magical world of Disney to your home with The Disney Castle! Free shipping now on orders over $35 EVERY DAY! Visit the World’s Biggest LEGO Shop! FREE Exclusive Snowglobe with qualifying purchases! FREE Exclusive 2017 Coloring Wall Calendar with qualifying purchases! 15% off orders $29+ at Beau-coup. Gifts, favors, decor & more! 15% off Anything in the Gifts Revealed Catalog – Shop Now! This sounds too crazy to be true, but remember how with Kohl’s (and others) you can shop online and pick up in store? Well, if you are running out of time Kohl’s is open 24 hours for Buy Online Pick Up in Store orders. The Kohls 24 hour schedule is from now until Christmas Eve at 6 pm. Buy Online, Pick Up In Store. Order by 5pm local time for items available in your selected store pickup location and receive it the same day with no shipping charges! On top of that, they are offering great deals on items and they have a wide variety to choose from. Toys for kids, clothing, accessories, home décor, and small appliances can all be found for great deals online. Take 20% off $100 or more with code WREATH. Valid 12/11-12/24.